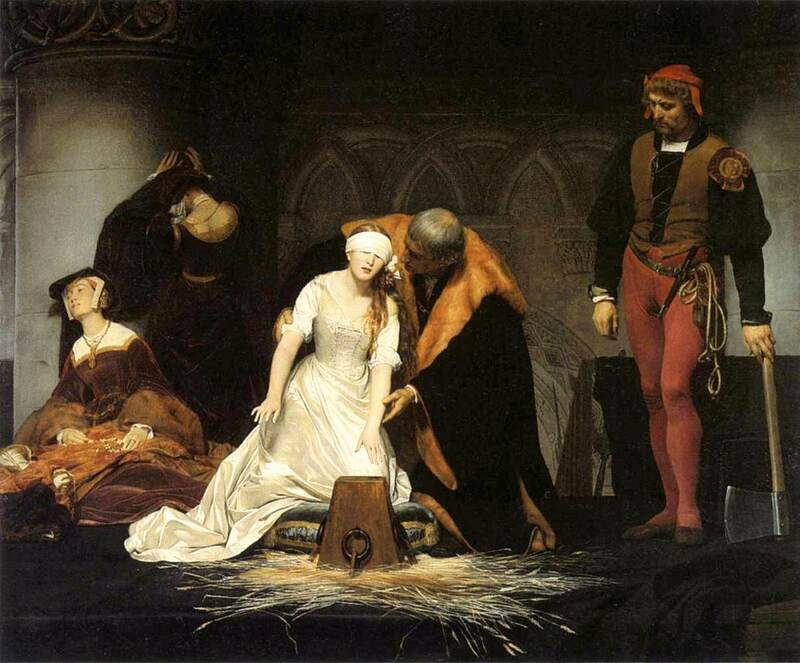 Paul Delaroche - The Execution of Lady Jane Grey (1833, National Gallery, London). The straw, commonly placed near the site of an execution, soaks up the victim's blood. Jane Grey (1537 – 1554) was the queen of England from 10 July until 19 July 1553. When the 15-year-old King Edward VI lay dying he nominated Jane as his successor. After his death she was officially proclaimed Queen of England. She became a prisoner when the Privy Council decided to change sides and proclaim her great-aunt Mary (aka Bloody Mary) as Queen 9 days later. Jane and her husband Guildford were both charged with high treason and sentenced to death. 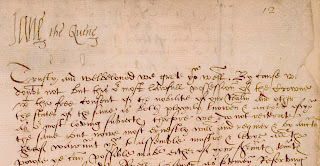 Jane was found guilty of having signed a number of documents as "Jane the Queen". 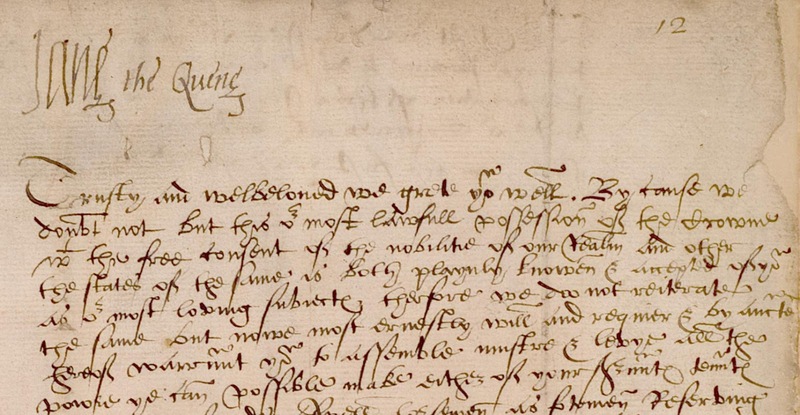 Official letter of Jane Grey signing herself as "Jane the Quene"
Her sentence was to "be burned alive on Tower Hill or beheaded as the Queen pleases". Guildford was beheaded at the public execution place at Tower Hill. Out of respect for her royal status Jane's beheading took place in a more private environment at Tower Green. The executioner asked her forgiveness, which she granted him, pleading "I pray you dispatch me quickly". She then blindfolded herself. Jane failed to find the block with her hands, and said "What shall I do? Where is it?". The Deputy Lieutenant helped her find her way. With her head on the block, Jane spoke the last words of Jesus as recounted by Luke: "Lord, into thy hands I commend my spirit!". The 16 year old girl was then beheaded. The painting by Paul Delaroche (1797-1856) was exhibited in Paris at the city's famous Salon in 1834, where it caused a sensation. Another bloody episode in the history of England's Kings and Queens. It was such a risky thing to be born into the royal family. Better to be a peasant. I’ve seen this painting in the National Gallery; from what I remember a large canvas, very moving.